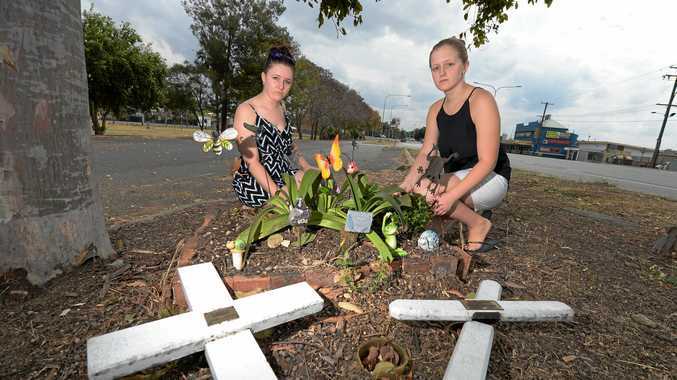 BRIGHT flowers usually surrounded two white crosses where Imogen Lebish could go to feel closer to her late brother. What was once a place of solitude to remember Kyle Lebish and his friend Brent Whittington, was now destroyed in an unimaginable act of vandalism. 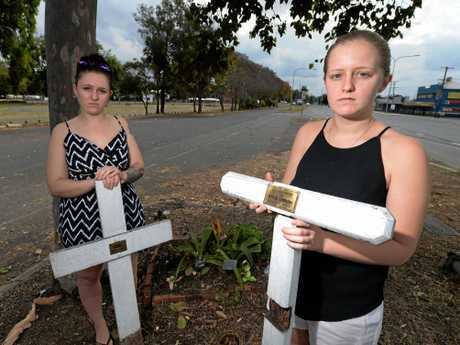 On a routine visit to the Lakes Creek Rd memorial on Friday, Imogen's parents were horrified to discover their son's memorial had been defaced. 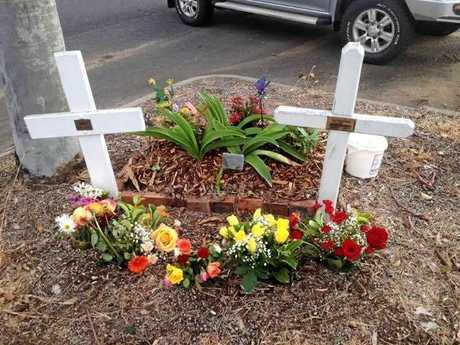 Both white crosses for Kyle and Brett had been ripped from the soil and Kyle's had been snapped in half after being untouched for seven years. The once beautiful, bright flowers were trampled and the men's place of memory was now a place of sadness. Imogen was "absolutely disgusted" to hear that somebody in her community could do such a disrespectful act. "There's no excuse for this," she said yesterday. "The act achieved nothing for them, but instead created more distress for both families knowing that this memorial has been disturbed. "Whether it was drunk vandals or a group of kids, it's just completely inexcusable." 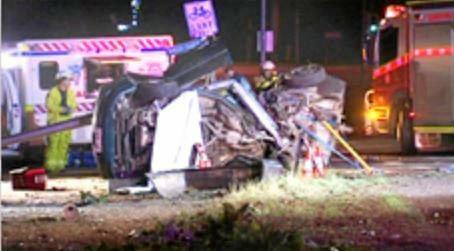 Kyle, 22, and Brett, 20, died in 2008 after losing control of their vehicle and hitting a light pole on Lakes Creek Rd before the car flipped on its side. The wreck of the car which killed Kyle and Brent in 2008. 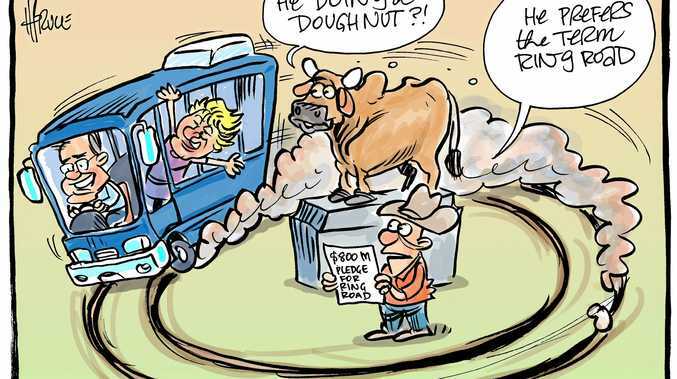 Brett, Kyle and his girlfriend were watching the State of Origin at a friend's house and were travelling home when an argument broke out between the couple. Kyle's girlfriend got out of the car and the boys drove off. The pair died instantly on impact and their memorial now lies in the place where best mates and keen motorbike riders were last together. 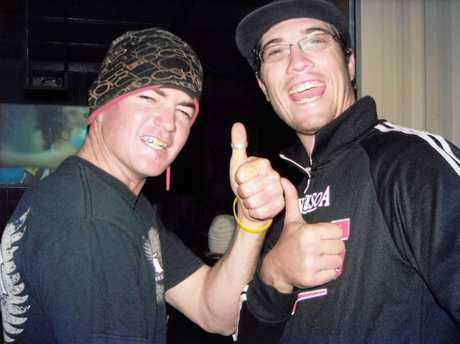 Kyle Lebish and Brent Whittington who died in a car crash on Lakes Creek road. Imogen was 9 years old when her brother tragically died and her older sister was 11 years old. She said the three of them were tremendously close and his death was still raw nearly eight years later. "We go there a lot to water the garden and just sit and reflect," she said. "Sometimes I play music and just sit and chat so it's a very important place for us and I'm just so angry what's happened." Imogen took to social media to express her outrage on the "heartless" vandals. "We are so shocked that some horrid, low-life people are walking around with this on their conscience," she said. The outpouring of support from the community to follow was not something Imogen expected saying it had been very overwhelming. "I've had tremendous support from everybody and it's just makes you wonder how someone among a beautiful community could do this," she said. "We've even had offers from people to help us replace it or cement them in with concrete, it's just blown me away." Brent's father, Roger, described his son as an "happy-go-lucky" man who would do anything for a friend. "He was always there for his mates at any time day or night," Mr Whittington said. The proud sister said her brother was always in her heart and she hoped the vandals realised what they had done.